The keyboard on Therese Gween's laptop is misbehaving. What can she do about it? Too bad you own a laptop. Desktop keyboards are easy to fix. Just buy a new one (they can cost less than $15) and plug it in. Since that's not an option, let's start with the next simplest fix: The driver. But first, just to play it safe, create a restore point. 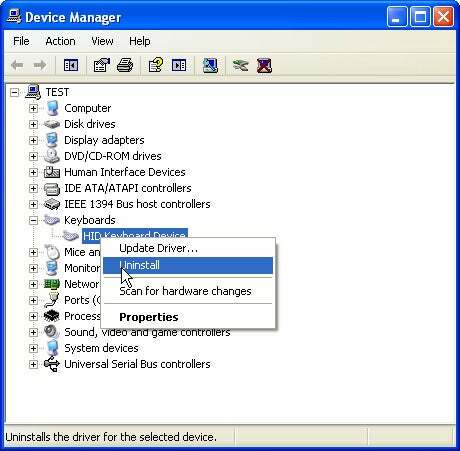 Once you're safe, open Device Manager: If you're using Windows XP, click Start, right-click My Computer, and select Properties. Click the Hardware tab, then the Device Manager button. In Vista or Windows 7, just click Start, type device manager, and press ENTER. Find your keyboard under Keyboards. Right-click it and select Uninstall. When it's uninstalled, select Action, then Scan for hardware changes. This reinstalls the driver. First, plug in an external keyboard and try using that. If the problem persists, your keyboard isn't the problem. Next, try working in a live Linux environment. This allows you to boot into Linux from a CD or flash drive, without installing the operating system. I recommend either Puppy Linux, which is small, fast, and easy for Windows users to figure out, or Ubuntu, which is much more powerful. Both download as .iso files. To burn either of them to a CD, double-click the .iso file. If that launches a program, follow the prompts. If it doesn't, download and install the ISO Recorder for Windows XP and Server 2003 or ISO Recorder for Vista and Windows 7. Then double-click the .iso file. If the problem persists in Linux, you can't blame Windows. If these tests determine that it's a Windows problem, try System Restore, going back to a date from before the problem started. If that doesn't fix it, I hate to say this, but you may have to reinstall Windows. See Reinstall Windows Without Losing Your Data for instructions. If it appears to be a hardware problem, you'll probably have to replace the keyboard. You might want to go to a professional for this job, but if you're feeling brave--and lucky--see Fix a Laptop's Sticky, Broken Keys.